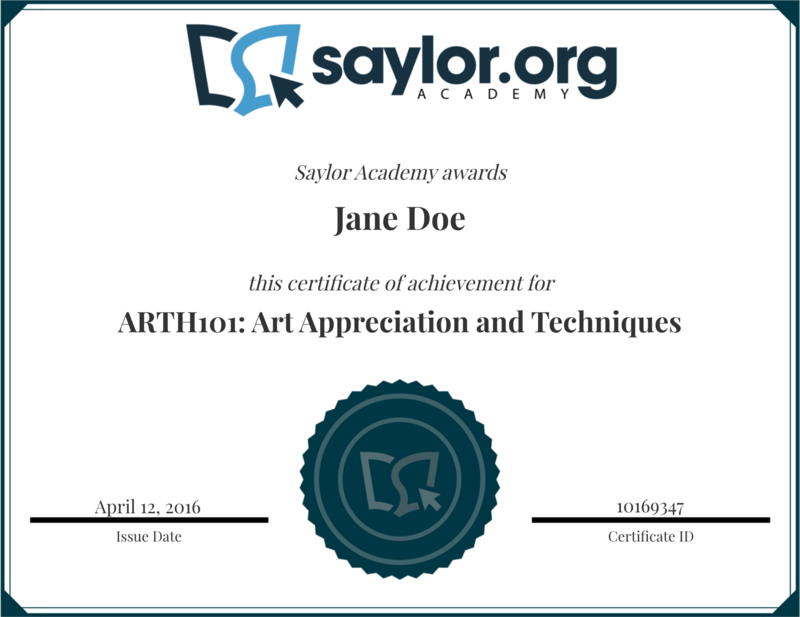 Saylor Academy courses provide free certificates of completion issued through our partner Accredible. These digital credentials allow students to present a rich and trustworthy record of their learning to anyone at any time. Click on the sample certificate below to see a live example of how you can put your best foot forward in your professional and personal networks. Continue on this page to learn more about the major features. Because these credentials are digital, hosted, and unique, anyone viewing your certificate knows that it was issued by Saylor Academy and only by Saylor Academy. Document your learning for free. With Saylor Academy, you can develop your learning portfolio without breaking the bank; keep your money and keep learning. Display on your LinkedIn profile. With one click, let your LinkedIn network know that you continually pursue excellence through your “always learning” approach! Include a personal or professional reference. Ask a coursemate, employer, or friend who can vouch for your learning to share a brief statement of support. Quickly share on social media. One-click sharing makes it easy to let your networks know about your accomplishments — and to help spread the word about Saylor Academy. Show or hide your final grade. Let people see where you stand — less than 100% simply means that nobody just handed this certificate to you! View as part of your Saylor Academy transcript. All of your public certificates display as a list of course titles on your digital transcript, which you can print or download. Are you ready to begin? Explore our courses and sign up today to start working toward your first Saylor Academy certificate!